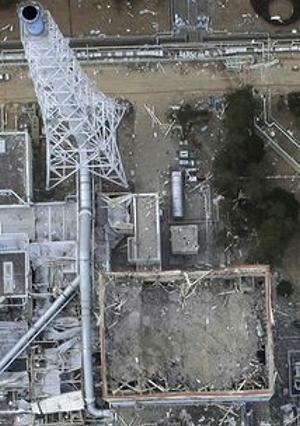 TEPCO officials said that most of the fuel rods in the Unit 1 reactor have melted and fallen to the bottom of the reactor. They said cooling water in this reactor has fallen to a level that would expose those fuel rods that are still intact. Holes have been created by melted nuclear fuel in piping at the bottom of the reactor’s pressure vessel, allowing tons of water the company has been spraying into the reactor to cool the fuel to escape. Still, TEPCO said that some water remains at the bottom of the reactor vessel and is keeping the melted fuel cool. TEPCO spokesman Junichi Matsumoto said the low level of water indicates that the core of Unit 1 is more damaged than previously believed. But temperatures in Unit 1 are still below dangerous levels because TEPCO continues to inject fresh water to cool the fuel, although much of the injected water is leaking through holes at the bottom of the vessel. The new information on the state of the fuel in Unit 1 emerged after workers repaired a water gauge Tuesday after entering the reactor building for the first time since a March 12 hydrogen explosion at the unit. Once fixed, the gauge showed that water in the reactor was at least one meter (39 inches) below the fuel rods. Under a strategy approved last month, TEPCO planned to fill the reactor containment vessel with water and circulate the water through a heat exchanger. But today, an official of Japan’s nuclear safety agency told reporters that flooding the containment vessel may not be necessary and the company should change its strategy. Hidehiko Nishiyama said TEPCO only needs to inject water to a height that would allow the system to work. Economy, Trade and Industry Minister Banri Kaieda said today that the water injected into the Unit 1 reactor has in fact leaked out through holes created by the meltdown. For this reason TEPCO’s plan must be reviewed, he said. TEPCO has injected more than 10,000 tons of water into the Unit 1 reactor but less than half that amount is thought to remain in the reactor or the containment vessel. The utility says the leaked water is likely in the basement of the reactor building, but high radiation levels prevent workers from entering the area. 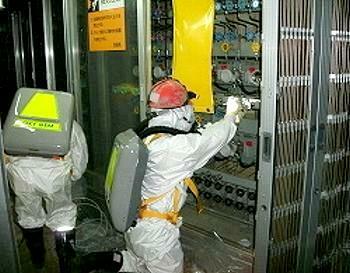 Robots could be used instead, but TEPCO says their wireless remote control system may not extend to the basement. TEPCO also has been spraying tons of fresh water onto Units 2 and 3, and contaminated cooling water from these reactor cores has been leaking. To prevent an estimated 70,000 tons of contaminated water from entering the Pacific Ocean, workers have been pumping it into a waste processing building while a system to purify the water is installed. Still, some highly-radioactive water has leaked into the sea past the silt fence that TEPCO has set up to contain it. Today, TEPCO announced it has begun preparation work to install a cover that will completely encase the Unit 1 reactor building, in accordance with its plan announced in April. The cover will be installed “as an emergency measure to prevent the diffusion of radioactive substances until mid-to-long term measures including radiation shielding are implemented,” the company said. 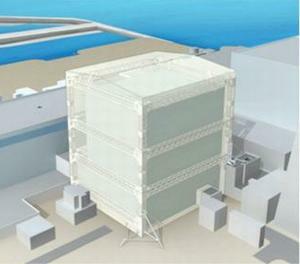 TEPCO said it will first level the ground to bring heavy crawler cranes onto the site. The crawler cranes will “minimize the exposure dose of the workers and shorten the work period,” the company said. Installation of the cover is scheduled to begin in June. The power plant 220 km (140 miles) north of Tokyo on Japan’s Pacific coast lost cooling functions on March 11 when the magnitude 9.0 earthquake cut off the outside power supply. The resulting tsunami disabled generators that were supposed to operate the reactors’ cooling systems in case of emergency. In the five days following the quake, there were hydrogen gas explosions in three of the plant’s six reactors, including Unit 1, and partial meltdown of nuclear fuel rods in Units 1, 2, and 3. Radiation releases caused more than 80,000 people to evacuate a 20 km (12 mile) radius around the power plant, and radiation has spread into the sea, the soil around the power plant and through the air.